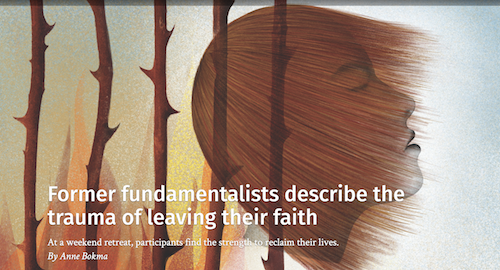 Good article, and yes, I am a former fundamentalist. I no longer believe the Bible is the inerrant word of God, or for that matter even inspired by God. I wrestled with my faith after 30 years of embracing it. Too many things made no sense. Questioning at first gave me night terrors. But then I used my brain for what brains are good for: research and reasoning. As a Christian I only read books to defend my faith, to support it. Now I was curious of the evidence on the other side. What helped me most to cross over was reading books by Bart Ehrman, professor of the New Testament at the University of North Carolina, Chapel Hill. He went to seminary to become a teacher of “God’s word,” but in studying biblical origins, the historical Jesus, and the origins of Christianity, he became un-converted. Like, do you know the gospels were not even written by Jesus’s disciples, nor their acquaintances? They were written 30–70 years after his death! Not even eye witnesses. Written anonymously. Names ascribed decades later. Ehrman points out errors in the gospels progression, like how Jesus became the “son of God” after baptism by John the Baptist in the gospel of Mark (scribed about 30 years after death), to “the son of God” in the womb in the gospel of John (scribed about 70 years after his death). How in Mark Jesus had passover with his disciples before his death, but in John he died during the Passover, signifying that he was the sacrificial lamb of God. Ehrman’s study and writings opened my mind and liberated me from the ancient dogma of the Christian faith, and once again, the fear of hell.